In our gentle craft we are taught to extend the hand of brotherly love to our fellow creatures. To love others and do unto them as you would have them do unto you. That we are to employ our faculties towards the betterment of humanity is the charge we are given, and to defend justice at the peril of danger our duty. This is at once what elevates and burdens us as masons, and though we vow to fulfill our obligations in all our doings our mortal shortcomings often fail us. Our perception being fallible we inevitably stumble or outright fail in our circumscribing of desires and bounding of passions, riding instead into sunsets to slay giants that turn out to be windmills. Masonry endeavors to make good men better, and should never be confused as a craft intended to sanctify the already enlightened. We will err, we will succumb to prejudice, to fear, to mere shadows made monstrous by the imagination and real through the clinging of past grievances unresolved. To contemplate these truths increases our capacity to forgive others, to be tolerant of quirks and to lovingly whisper good council, giving warning without judgment as to the approach of danger. But what then when in our haste and impulse we do things we feel remorse for? How do we manage our own betterment and healing in the face of injury inflicted by our own hands on those we hold dearest to our hearts? The character of a man should be measured not only for the care he takes in erecting his moral and Masonic edifice, but also in the manner in which he endeavors to make upright and square stones he has set askew. That he be willing to admit his faults and own his mistakes, rectifying that which is out of plumb with urgency and vigor, is as much a measurement of his skill as any matrix employed to judge his handiwork. Short of murder, treason, or moral turpitude - those grievances for which forgiveness is far too onerous an expectation – opportunity should be granted for mercy and grace. If injured, make room in your heart for your fellow, speak of your pain to him, let him know your needs and expectations, and allow him the peace your burdened heart would require to move forward if the situation were reversed and it was you offering heartfelt apology. As creatures endowed with limited perception we are rarely able to capture the totality of any situation; hence, we should strive to be ever humble and soft in our judgments. As such, is it unreasonable to expect that from time to time and perhaps even often we will fall short of our own potential? How then will you be willing to treat the man you see in the mirror? Will you extend to him the same compassion and forgiveness you would extend to another? I posit that the healthiest course of action whenever we have wronged another is to admit our shortcomings not only to those we have wronged but also to ourselves, to endeavor to find meaning and opportunity for growth and self-improvement, but most importantly, to expand our own capacity to forgive others. The man in the mirror is at once your greatest ally and staunchest critic. He is at once best friend and mortal enemy. Extend to him the hand of brotherly love and do unto him that which in a similar situation you would have him do unto you. Of this, dear brothers, take due notice and govern yourselves accordingly. Bro. 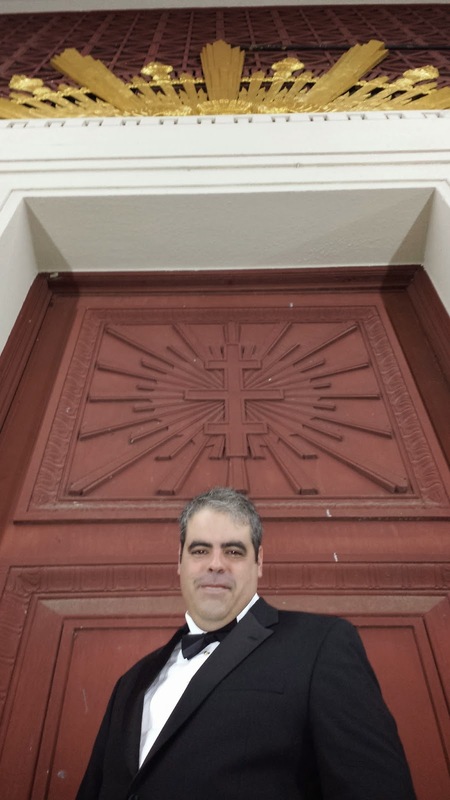 de la Cruz is the Junior Warden of Sotoyome Curtis 123, Healdsburg, CA. He is also a 32nd degree Scottish Rite member as well as a Royal Arch Mason. He is a father of two, husband and resident of Windsor, CA. Excellent article. Definitely needed to read that today. Excellent indeed, Bro Juan. Kudos! Did George Washington Break His Obligation?